Here is the latest in our ongoing CeliacChicks Around The World feature. This was sent in by Kat Brooks. Thank you, Kat! On 9-22-08 I discovered a fantastic store on Route 1 in Scarborough, Maine. It’s called Lois’ Natural Marketplace and I felt like a kid in a candy store! They had loads of gluten free foods – a great variety of manufacturers in all categories. Quite a lot of it was produced locally by folks with celiac relatives and Lois, the owner, managed to get this huge assortment of foods in one place. There is also a sandwich and soup bar, and the chefs there make nearly everything gluten-free. I got some Greek Chicken Soup and it was so nice to be able to eat something without worrying if the person just told me it was gluten free to brush me off. Everyone I spoke to was very knowledgeable about celiac disease and they offered to special order anything I couldn’t find. It really was a pleasure to shop there! The baked goods there are to-die-for! I can’t even remember the last time I ate anything with pumpkin in it, which is my absolute favorite, and I was nearing ecstasy with their moist and decadent Pumpkin Chocolate Cake. Yes, I ate the whole thing! And this morning I ate the Blueberry-Peach Coffee Cake and that was delicious beyond words as well. I am looking forward to polishing off my Carrot Cake tomorrow. I am also looking forward to trying out the Pineapple Coconut Ginger Granola I purchased. Not only can I not eat wheat, I can’t eat soy, almond, sesame or sunflower (there are 11 other foods I cannot eat as well) and I was still able to find plenty of foods at Lois’. I recommend this store to everyone – even if you don’t have food allergies – they feature organic foods and healthcare items as well. I was also lucky enough to meet Lois herself, so I thanked her for giving people like me a place to actually find something good to eat! P.S. – They have a nice, big, clean restroom! Website is not yet up. If you know of any other gluten-free friendly places in Maine, feel free to share with us in the comments below. Thanks! Please sign up for our Email Newsletter. We promise that spam is not on our diet! « Gluten-Free Giveaways: Win FREE Chocolate For A YEAR! Hi! In Sweden, were I live we don´t have that kind of store. I would love to find a place that near my hometown. Next time I visiting the US I think I take a trip to Lois’ store. So nice to know we have a reader in Sweden! I feel fortunate to live near the Natural Living Center in Bangor, Maine. This store has an aisle of gluten-free foods and ingredients. In addition to packaged flours, they also have bulk bins with rice flour, potato flour, and so on as well as an area in frozen foods devoted to gluten-free foods. The Natural Living Center also has an in-store cafe that has always offered things like wraps and coffee, but recently they have put up a sign that the cafe now has gluten-free desserts. I haven’t had a chance to try them yet, but I am looking forward to the opportunity! They have all types of baked goods, mixes, as well as breakfast sandwiches. Tiny little place, very good things! Royal River Natural Foods is on Route 1 in Freeport, about a 2 miles south of L.L. Bean and all the shopping. I’ve only popped in once, but remember them having a pretty impressive gluten-free section. Also, most Hannaford’s and Shaw’s supermarkets around the state with natural food sections (some of the older/small stores don’t have them) carry many GF foods. Can anyone suggest a really good GF bread, roll or bagel that they like? I have been eating Deland bakery bagels for 6 months and have been really sick. I just found out that they are not GF!!! I was going to buy Jones Great Gluten Free and Grainless baker for bread and Kinnikinnick for muffins, but can’t find 1 online store that sells all. The shipping cost is way to much to make it worth buying them through the bakeries individually.Especially since I don’t even know if I’ll like them. Sorry to disappoint you, but there is no such thing as store bought “really good” GF bread. If I knew where you are located, I could be of more assistance. Also, are you looking for snack bread, or sandwich bread? 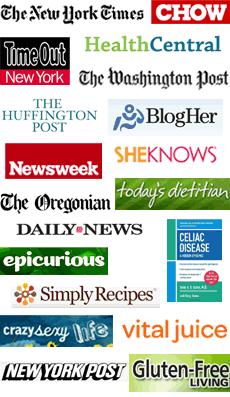 Are you new to Celiac? Do you have other allergies? Without having these answers, I can suggest the following: a) use some of the great recipes on this web site to make your own bread; b) find a bread you like and make the jump to buying them online; c) find a store in your area where they sell gluten free bread and start sampling them until you find one you like. I currently purchase EnerG Improved Corn Loaf at my local store because it is Gluten Free, Wheat Free, Dairy Free and free of the 15 other foods I can’t tolerate. It is one of the least expensive breads, and like all store-bought GF breads, it MUST be toasted. Online, I used to purchase Garbo Gluten Free Sport Bread, which was a nice, hearty bread, really good tasting – TOASTED. I bought this from the Gluten Free Mall – http://www.glutenfreemall.com. After being diagnosed with soy allergy – I had to give up that bread, and I’m not sure they carry it any longer. Read the reviews about other breads on their website – many customers leave them – and they will help save you a lot of frustration and money. My other favorite online store is the Gluten Free Trading Company in Wisconsin. http://www.food4celiacs.com/ They don’t have reviews on their site, but they are a very friendly place. If you live nearby, you can go to their store instead of ordering online. There’s a new gluten free bakery in Brunswick, Maine, that is great. Homemade bagel, muffins, cookies and other treats as well as a variety of other GF products that they don’t make there. They make a very good french bread loaf every Saturday. Worth a trip if you’re in Maine this summer! Unfortunately, Anello’s in Wells moved to Portsmouth, NH (a little further away from my home in Kennebunk, ME). All was good – the food was AWESOME, but then right before Christmas 2009, Traci had to close her GF bakery. Pepperel Square Boutique in Saco carries a few GF items, but they don’t keep a big inventory on hand, so you never know what you might be able to get if you don’t pre-order. Whole Foods brand hamburger rolls are pretty good. My son loves their blueberry muffins and the corn bread is great. Lily’s Cafe in Stonington Maine makes gluten free sandwiches and salads and their dinner menu on Friday night is 80% gluten free. Very good. Local, fresh and the chef is the owner. I understand you have moved to Portsmouth. Do you sell gluten free carrot cakes to go?